Jane Stanbury has had a wonderful time with raw nature, plus some much appreciated luxury. 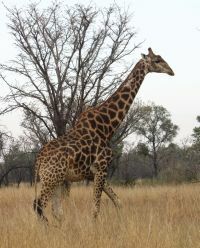 Welgevonden, meaning “well found”, is one of South Africa’s most appealing game reserves. The park spreads across 38 200 hectares and is where biodiversity, conservation and game viewing combine to bring a spectacular wildlife experience for visitors. The landscape is dynamic, dramatic escarpments cut through rolling mountains, whilst broad gorges and scrubland meet verdant, forested areas with flat topped hills. The park forms 4000km of the Waterberg Biosphere Reserve, which was given UNESCO status in 2001. It's rugged, it's wild, it's magnificent and is home to over fifty types of mammals including South Africa’s big five, in order of size, Leopard, Lion, Water Buffalo, African Rhino and African Elephant. This breathtaking scenery combines with an abundance of game to create a truly magical, mesmerizing place. Words are not enough to describe watching a pride of lionesses enjoying the morning sun just a predator’s leap away, or driving at a sedate pace flanked by rhino, or enjoying a sundowner gin and tonic surrounded by zebra, impala and the occasional passing giraffe passing. I was slightly nervous about encountering real wild life after dark but was completely focused on searching through the dusk and darkness as we startled a water buffalo ambling through the bush, met the gaze of crocodile eyes by the lake and came across the bashful species of hyena, pangolin, and aardvarks. A safari is only as good as the animals you spot and Heath, my field ranger, could pick out animals where we just saw shadow. By his own admittance he was more at home on the maze of bush roads than if he’d had a map in downtown Johannesburg. His knowledge of the bush was expansive and rarely did a question go unanswered. He was also my hero. I’d been constantly reassured that I wouldn’t come across a snake, it was very rare and unusual. 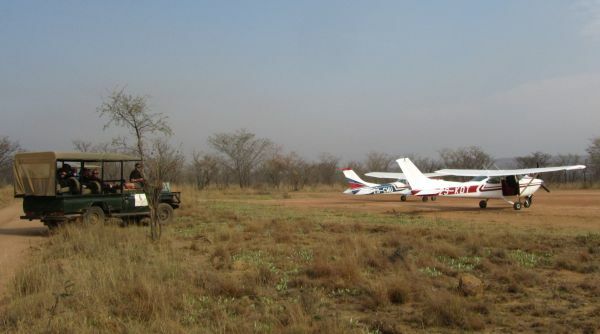 Following a two-hour drive from bustling Johannesburg (you can fly in 45 minutes to one of the parks two airstrips) I arrived at the park’s main gate. The peace of the mid-day sun was disturbed by the flapping, scurrying sound of birds. Turning to establish the noise’s source I saw a snake-head peering up at me. Granted it was a small snake but I didn’t know what type it was, and aren’t the small ones the deadliest? Just ten minutes later as I had retreated, slowly, to some distance, abandoning my luggage to its fate, Heath drove up looking somewhat bemused. I explained my predicament and he went to check on my serpentine friend. It was a spotted bush snake, completely harmless, but to a game reserve novice it may as well have been deadly. I needed a gin I said laughing, and astoundingly he poured me one from his truck’s picnic hamper. I hoped there wouldn’t be, Welgevonden is a gun-free game reserve, we had no weapons and I can’t imagine how many tons these animals weigh. Guns, the park management believes, encourages unnecessary boldness. Heath explains, “If a ranger has guns on board there can be tendency to think you are invincible and that’s when situations can go horribly wrong.” In effect it’s the weaponry version of Dutch courage, and it could be fatal. At Welgevonden the only rangers who carry guns are the guards seeking to protect our hefty friends from Rhino poachers, it remains a strong and prevalent problem that all reserves are trying to negate. During the evening we stop dead in our tracks as a bull–elephant crosses the road to reach his favourite snack area. Taking his time, the immense, but beautiful animal selects his preferred tree, and snap, supper is served. The highlight of the stay was witnessing a mother cheetah calling for her cubs. She had lost her cubs and lions were nearby, cheetah cubs make a tasty snack for the pride and she was desperately seeking them out. We were all genuinely concerned about their safety, how quickly we had come to be absorbed in the cycle of game reserve life. Later we learned she had found them and a morphic wave of relief went through the lodge. Welgevonden hosts a very limited number of exclusive commercial and private safari lodges built on their own specified plots. Each is extremely private, hidden from the views of others. They have been built to a strict aesthetic code and only fifteen welcome paying guests. Home for my two-day break was Ekuthuleni lodge, situated on open plains in the park’s centre. An unfenced lodge, it offers expansive views of the savannah. Spread across a number of beautifully appointed buildings combining luxurious comfort with wonderful African paintings, sculpture and crafts it welcomes just ten guests in five thatched bungalows. Guests are encouraged to enjoy the communal spaces for reading, chatting and partaking in delicious meals prepared from the freshest of ingredients. Each suite offers outdoor and indoor bathrooms, sumptuous beds, locally produced furniture and vistas across the wild plains. 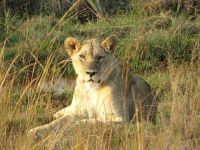 The lodge offers morning and evening game drives that aim to introduce guests to as many animals as possible. Nothing is guaranteed but the early morning safari welcomes a new day as the park awakes and the animals come out for their morning constitutionals, whilst as the dusk settles the evening darkness quickly envelops you and the bustling, bashful nightlife awakens. The park never sleeps. It's three in the morning and the words of Heath are ringing through my head. Don’t go out after dark without one of the lodge team. It was just 100 meters from the lounge to my wonderfully welcoming hut. Something is moving just outside my door, I’ve heeded the instructions and locked myself in but left the inner doors open to maximize the freshest of air. It’s probably just the wind I thought, then I hear what are most definitely steps and then I hear a branch crack. There’s only one sound associated with that, elephants. I laid on my bed wondering if the hut would withstand the ramming of an enraged elephant and decided I wouldn’t look out of the window as much as I want to, I love elephants. Getting up just two hours later for the morning safari I mention my midnight visitors, yes I’m told four elephants passed through the camp last night. Welcome to the bush I thought, and I was beyond ecstatic to be there.